Having published their poll results, Jim Henson goes back and analyzes their gubernatorial poll, pronouncing it all a big success. The partisan responses to the poll results have been similarly predictable. The Republican chorus is singing I-told-you-so, chalking up Davis’ position to the impact of the media pack reporting of her biographical fudges. The Democratic peanut gallery has pointed to the fact that the poll was in the field before Ted Nugent did a double live gonzo on Abbott’s thus far business-as-usual campaign. None of which is to say that Davis’ campaign has collapsed, as some critics, both friendly and hostile, have suggested. These new numbers are less a sign of the decay of the Davis candidacy than a reversion toward the mean ­– that is, a return to the expected steady state. Davis’ 6-point deficit in the October 2013 UT/TT poll reflected the final dance of her very public coming out party as the excitement that propelled her into the race in the first place receded into the realities of day-to-day campaigning. 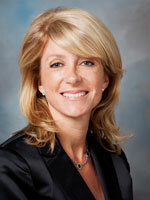 At the time, Davis was in a unique position for a Texas Democrat, known by a greater share of the electorate than her Republican counterpart. Davis now finds herself trailing by 11 points, but this current state reflects the underlying partisan composition of the electorate – not some major, event-driven shift in sentiment. Maybe I’m the only person fixating on this, but as I said before, the problem with comparing the two polls is that in the first one they asked about three candidates – Davis, Abbott, and Libertarian Kathie Glass, who drew five percent – but in the second one they only asked about two. It seems likely to me that Glass would have drawn a few points away from Abbott, but even if you think the effect would have been more or less evenly distributed, the fact remains that Davis and Abbott likely would have had different numbers in a two-person matchup than they did in the three-person race that was polled. I say that makes the two polls not directly comparable, and I fail to understand why in two different articles so far neither Henson nor Daron Shaw has even mentioned this difference, if only to dismiss it as the useless obsession of some punk blogger. It’s a small thing, but I really don’t think I’m asking for too much for them to acknowledge the difference. While Davis needs to both mobilize large groups of Democratic voters in an off-year election and persuade no small number of Republicans to defect, the task is becoming harder by the day. Among key groups that Davis might hope to court, Abbott looks stronger – at least so far. On the trial ballot, Abbott leads Davis 42 percent to 40 percent among suburban women;among Hispanics, favorable attitudes toward Abbott have increased from 21 percent in June 2013 to 30 percent in October to 39 percent in our most recent poll. Add to this that most of the Texas electorate, especially in non-presidential years, tends to be white — where Abbott leads Davis 57 percent to 32 percent — and Davis’ challenge only grows. Maybe you looked at that 57-32 lead Abbott holds with Anglo voters in this poll and said “Huh, that’s a pretty big lead” and didn’t give it another thought. Or maybe you were curious enough to wonder how that might compare to other recent poll results in Texas, since putting a number in context always makes it more useful than not putting it in context. If only there were date from previous polls to which that could be compared. Well, of course, such data does exist, as Jim Henson well knows since some of that data is his own. See those Texas poll results there on my sidebar? Let’s click through a few of the recent ones to see what they tell us about Anglo voter preferences in our fair state in the last election. In other words, according three different polls, one of which was Jim Henson’s own UT/Texas Trib poll, Mitt Romney was leading President Obama by a range of 39 to 45 points among Anglo voters, which is considerably more than Greg Abbott’s relatively puny 25-point lead with them over Wendy Davis. In fact, if you substitute the 57-32 numbers they found in favor of Abbott for the 67-24 numbers they had for Romney and recalculate the raw totals based on that, Romney’s lead drops from 14 points (53.88 to 39.75) to three points (47.38 to 44.5). And Henson wants us to believe this represents a “growing challenge” to Wendy Davis? Henson didn’t just bury the lede in his story, he first strangled it with a lamp cord, then covered up the grave with loose vegetation to throw off the searchers. For some bizarre reason, the Lyceum poll has no breakdown by race of the 2010 gubernatorial election. They have it for other races, but not Perry versus White. I’m sure that’s an inadvertent omission in the publication of the crosstabs, but go figure anyway. Once you get past that, the first thing you might notice, if you compare the crosstabs from 2010 to the crosstabs from 2012 for the UT/TT poll is that the racial makeup of each sample is identical, with roughly 65% of the total being Anglo. Henson and Shaw then take the raw totals backstage and do their proprietary statistical mumbo-jumbo on them to produce the result they then write about. That’s the basis (via PDiddie) of RG Ratcliffe’s complaint about Trib polls. But putting that aside, Henson’s own polling shows that Abbott went from a 39-point lead among Anglo voters in 2010 against Barbara Radnofsky to a 25-point lead among Anglo voters in 2014 against Wendy Davis. The drop is smaller in the Governor’s race poll, where Bill White trailed Rick Perry by 30, but that’s still a five point improvement for Wendy Davis. Why isn’t this precipitous drop in support among Anglo voters for Republicans the story? What am I missing here? By the way, if you do the same math for the Abbott-Radnofsky numbers that I did for the Romney-Obama numbers, Abbott winds up better off – he still leads BAR by a 50.3 to 39.7 mark, which is pretty close to the lead Henson reports Abbott having over Davis, though down quite a bit from the 20-point lead they actually showed him with in 2010. The difference here is due to Abbott being in a near-tie among Hispanic voters with BAR; Rick Perry had the same result against Bill White in that poll. While Henson says Abbott’s favorability numbers among Hispanic voters are trending up he doesn’t say anything about the horserace numbers among Hispanic voters. For reasons I don’t understand, the Trib doesn’t include the crosstabs of their own polls when they report on them. You have to go to Henson and Shaw’s other home, the Texas Politics Project, to find them. Turns out Henson does show Abbott leading Davis 40-36 among Hispanic voters, a result that ought to be even bigger news than the topline but which does even warrant a by-the-way. That isn’t a fluke, either – David Dewhurst leads Leticia Van de Putte 33-31 among Hispanic voters, though poor Dan Patrick trails her by a 35-27 margin. Nobody’s really claiming Hispanic voters went nearly 50-50 for Republicans in 2010, or that they’re set to do the same thing or be even more favorable to them this year. Henson and Shaw certainly aren’t, or surely they would have said so by now. This is an artifact of their very small sample size – 130 Hispanic voters total, for a margin of error of 8.6% – and their odd construct, which is why it attracts so much criticism. Whatever mumbo-jumbo they’re doing behind the scenes, they must be doing a lot of it. I get that Henson and Shaw are making their best guess about what the electorate will look like in November, just as every pollster ultimately does. They expect that the electorate will tend to favor Greg Abbott, and by God that’s what their results show. But this poll, with its bizarre but completely unmentioned crosstabs, is national news, as is that highly questionable Democratic primary poll. If the goal was to get people talking about this race – especially if the goal was to get people talking to Henson and Shaw about their perception of this race – then this has been a big success. If the goal was to help us understand what’s actually happening in this race, then I’d say there’s still work to be done. But don’t worry, I’m sure their next poll will clear up any lingering questions.